The USS Constitution is one of the oldest warships in the world. A British ship, the HMS Victory, is older, being built in 1778, but has been dry docked in Portsmouth, England since 1922. The USS Constitution is a wooden-hulled heavy frigate with three masts. The ship measures 305 feet long from stem to stern, 43.6 feet wide and the main mast stands 204 feet tall. The ship weighs about 1,500 tons. When and Where Was the USS Constitution Built? The ship was commissioned and named by George Washington in 1794 and built at Hartt’s shipyard in Boston between 1794 and 1797. The ship’s copper bolts and fittings were forged by Paul Revere. The ship gets its iron-like strength from the triple layers of dense pine and oak used in the construction of the ship’s hull. The USS Constitution was one of six ships commissioned by Washington to help defend American merchant ships under threat from French privateers along the U.S. coast and in the Caribbean. When Was the USS Constitution Launched? President John Adams attended her launching party on September 20, 1797 but the ship was so heavy that it weighed down the slip way boards and she became stuck. It took another month of rebuilding and raising the slip way to get the ship into Boston Harbor. Notable guests at her second launching party, on October 21, included three exiled French princes: Louis Philippe (who would later become King of France), Antoine Philippe and Louis Charles, who had fled France due to the chaos and violence of the revolution. The USS Constitution fought in numerous battles of the War of 1812. 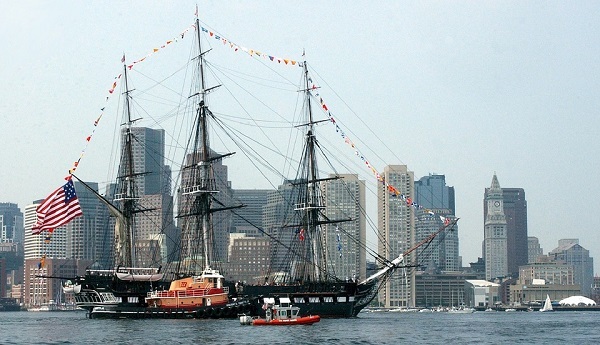 The ship earned the nickname “Old Ironsides” after it fought the British ship, HMS Guerriere, on August 19, 1812 during the early phase of the war. During the battle, several cannonballs hit the USS Constitution and simply bounced off the ship’s sides. The crew noticed this and declared the sides were made of iron. The ship’s officers and several press publications started using the “Old Ironsides” nickname and the name stuck. The USS Constitution defeated five British warships during the War of 1812, the HMS Guerriere, Java, Pictou, Cyane and Levant, and captured many merchant ships. After the War of 1812, she served in the Mediterranean and helped intercept and capture slave ships, such as the H.N. Gambrill, off the coast of Africa. 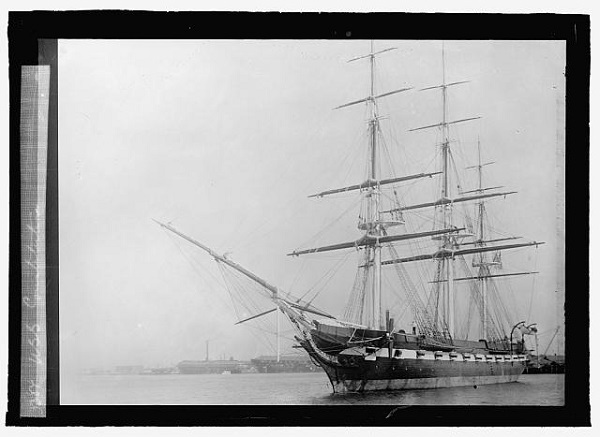 After the support of Captain “Madjack” Percival, and a strong public reaction to a newly published Oliver Wendell Holmes poem titled “Old Ironsides,” saved her from being scrapped in the 1840s, the Navy renovated the ship and sent it on a world tour between 1845-1846 under Madjack’s command. The purpose of the tour was to chart areas not covered by the Wilkes expedition. The ship stopped in Brazil, Madagascar, Singapore, Malaysia, Vietnam, Hong Kong and Hawaii before receiving orders to sail to Mexico to provide provision for the impending U.S. war with the country. During the Civil War she served as a training ship for the US Naval Academy before retiring from active duty in 1881. After retiring, the ship housed sailors at the Portsmouth Naval Shipyard in Kittery, Maine until she was designated a museum ship in 1907. In 1931, she toured the U.S. in a 90-port tour and raised her sails again on her 200th birthday in 1997 and on the 200th anniversary of her battle with the HMS Guerriere on August 19, 2012. 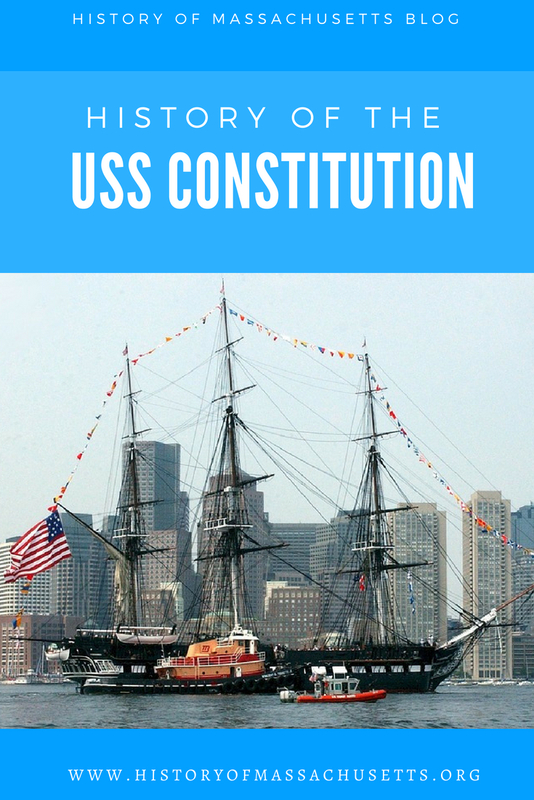 The USS Constitution is still a fully-commissioned Navy ship and makes a few trips into Boston Harbor each year, such as on the 4th of July, in order to turn the ship around so it gets equal exposure to the elements while docked. The ship salutes Fort Independence, a Revolutionary war era fort at the mouth of Boston Harbor, with her cannons during each turnaround trip. The ship is now docked at Charlestown Navy Yard in Massachusetts and is open for free guided tours throughout the year. i love this website! very useful.